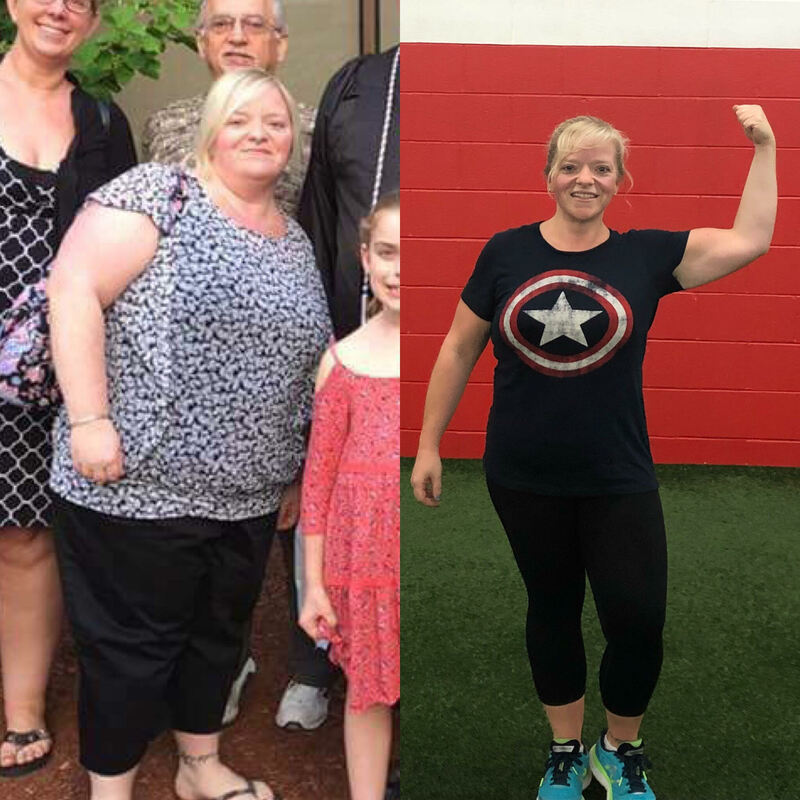 My Fitness Journey: How I Lost 76lbs at DSC! I joined DSC a year ago this September. After failing at two prior gym attempts, I saw an add for the Women's Beginners Group and figured I’d give it a try. I LOVED it from the beginning! The support of the coaches, other members, and pure fun I had motivated me to keep coming and even move on. After two months I was seeing and feeling results, and people were starting to notice it too. I soon felt great and it motivated me to try the Adult Group Training Program. I started out twice a week, then eventually increased to three times a week. After 8 months I was down about 50 pounds and 5 pant sizes, but I had hit a plateau. I was ready for the next step and I knew it was time to really improve my nutrition. That’s when I decided to join DSC's Nutrition Program back in May. At that time I also increased my membership to Unlimited Adult Group Training classes. Since May I have lost 22 pounds, two more pant sizes, and 3 inches off my waist, hips and thighs. Before joining the DSC nutrition program I wanted to learn how to eat healthy to lose weight. I didn't want just a cookie-cutter "weight loss" plan or diet. I was making healthy food choices and avoiding high fat foods, but I felt stuck with how I was eating and wasn't seeing the progress I wanted to, and hit a major plateau with my weight loss goals. I knew I needed more education on making the right food choices. I was hoping the nutrition program at DSC would get me over the plateau I was stuck on, support my weight loss goals positively, and teach me good food choices. I needed to learn how much of and what I should be eating every day and how to make permanent changes in my eating habits. I felt like I was struggling with eating the same things every day, not knowing what I should be eating around my workouts, and not knowing the quantities of different foods and nutrients I should be eating. I felt like even though I was making healthy choices by avoiding high fat foods and carbs I wasn't losing the weight like I wanted to. I would read about different diets on the internet and they all seemed so difficult to follow and had mixed reviews over what was good and bad for you. The nutrition program at DSC helped me with my struggles immensely. I was able to add healthy fats and carbs to what I was already eating. My experience with the nutrition program as well as my workouts at DSC has been a life changing experience. Not only are the workouts fun, but the support from the athletic coaches as well as the nutrition coaches are what has made me successful. I love everyone at DSC, they are all so smart and supportive, and never judgmental. I've met some great people there in the other members and have made several new friends along the way. The other members are all so supportive too, and I've NEVER felt like I don't belong there, even when I was brand new to working out. Since joining DSC a year ago, I have lost 76 pounds, and 6 pant sizes! I've dropped 22 pounds since joining the Nutrition Program. I've also lost 3 inches off my waist, hips and thighs. I have more energy than I've ever had! I'm buying new, smaller clothes every month and just feel so good overall. DSC has not only helped me physically, but I have more confidence in myself than I've had in years because I just feel so much better about myself. The biggest impact DSC has had on me is the overall lifestyle change. I do things now I NEVER thought I'd do, like 5K's and obstacle challenges. I plan my days and schedules around my gym time, not my meal times anymore. I've learned how to eat healthy for life, and not only by counting calories, but with other important things like mindful eating, getting enough sleep, and how to eat healthy away from home and while eating out. My advice to anyone who is thinking about joining the nutrition program at DSC is to do it! It's not difficult to learn, and the support from the coaches will get you through anything you need to. You will feel better, and be able to eat more than you think. When I started to lose weight I told myself I wouldn't join a diet program where I had to count and measure everything, but DSC is not that at all. It's not a diet plan, but a way of eating for life! DSC's fitness and nutrition programs have had a huge impact on my life and I don't think I would be successful without them. Before joining DSC I had been overweight for 20 years and NEVER thought I’d get to the point I’m at now. Joining DSC has completely changed my life and I’m so thankful to everyone there.